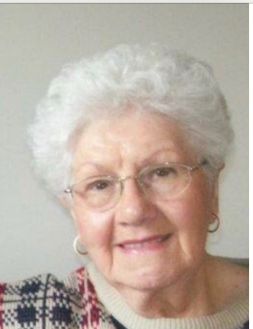 Obituary for Ina Faye (Wingate) Toy | Herald & Stewart Home-Funerals, Inc.
Ina Faye Wingate Toy, widow of Paul Toy, of Mt. Sterling, passed away Saturday, April 13, 2019. She was a 91 year old native of Hope, daughter of the late Russell and Catherine Dunaway Wingate, secretary for Central KY Termite Company, and member of the First Church of God. She is survived by 2 daughters, Kathy (Dudley) Hayes and Shirley (Brian) Shale, a son, Kenneth (Louise) Toy, 3 granddaughters, Amy (Amie) Botts, Kellee Campbell, and April (Jim) Woessner, 2 grandsons, Al (Joanna) Botts and Shane (Penny) Toy, 2 great-granddaughters, Victoria Toy and Eliza Toy, 3 great-grandsons, Aaron Botts, Hunter Toy and Cooper Woessner and 2 brothers, D.C. Wingate and Lewis Wingate. In addition to her husband and parents, she was preceded in death by a brother, Linvile Wingate. Her funeral will be 1:00 Thursday at Herald & Stewart Home for Funerals, Pastor Frank Curtis and Pastor Aaron Conn presiding, with burial in Fortune Cemetery. Visitation is 5-8:00 Wednesday. Pallbearers are Shane Toy, Al Botts, Hunter Toy, Aaron Botts, Jim Woessner and Matthew Wingate. Honorary pallbearers are Robbie Cartmill, Jim Wingate and Sydney Traylor.